Since my husband is almost always the family’s official photographer, it’s not surprising that I get to have more bonding moments pictures with my son. I make sure, however, that during important occasions in my son’s life that I take a picture of my two boys. I have already posted some of their pictures together in my previous articles, and what I’ve posted here are some of the older photos. This entry was posted in Daddy, Daddy Moments, Mommy Moments. Bookmark the permalink. your husband didn’t even cgange a bit, physically wise. thanks for sharing this sweet moment of them. 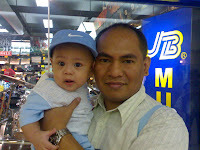 very cute pics here ng daddy and Justin! Me too! As much as possible I take pictures of them together. Especially camera shy husband ko, he also takes most of our pictures. And filing their photos like yours, is very rewarding just looking at it. Ang sweet ni daddy at baby justin…I’m sure they will have lots of bonding moments when justin old enough to immitate daddy. Parang pinagbiyak na bunga! 🙂 Very cute! Oh cute tingnan sila daddy at anak. thanks for sharing. My entry is also late but hope you can visit. “There has been an error of some kind. Ack! 2. If you are the publisher of this feed, sign into FeedBurner and visit your feed’s “Troubleshootize” tab to view FeedMedic, our automated diagnostic report for your feed. A cause for the problem, and tips for troubleshooting it, may be found there. juz followed your blog so that I will not be late again..he..he..
Hubby’s camera shy but I am the official photographer of the family.It always warms my heart to see dads bond with their kids. So precious, isn’t it, dear? ang cute ng mag ama..haha..proud daddy talaga sya. Thank you for sharing these memorable moments.